Live Big: Storm is a @PurinaCanada ambassador! Like Dakota before her, Storm is a rescue dog. We found her at a rescue that was listed on petfinder.com in late January last year. We went and saw her a few days after we made contact with the rescue, and instantly fell in love with her. Since then, she has filled our home with excitement, and our hearts with love. It’s been a long time since we went through the puppy stage. This time around, Wendy and I were lucky to have the girls with us to share the experience, and to learn new things about each other along the way. 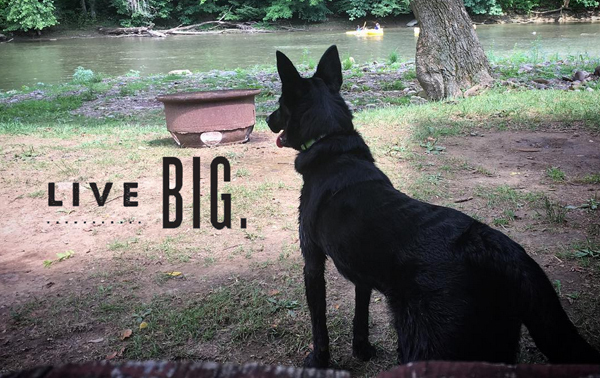 Storm is a perfect ambassador for Purina’s “Live Big” campaign! She’s a 35lb Bordie Collie mix, but she thinks she’s a Great Dane! Well, to be fair… according to the DNA test we had done on her, she does have a small percentage of Great Dane in her. I guess she plays that “under 10%” well. She runs like Usain Bolt, cuddles like a plush teddy bear, and jumps like she is on a trampoline! It’s absolutely amazing how high she can jump, especially if she sees a squirrel running along the top of our fence! What does it mean to “Live Big”? Her list isn’t long, but it is filled with mighty big things! Maybe this heading should have read: “Finding ways to tire Storm out”. She is a very active dog! This has turned out to be a great thing for all of us! We get outside with her and explore our neighbourhood. As we walk we’ll talk about the day, plans for the weekend or sometimes just admire the amazing place that we live. Last year, the girls and I spent 70 days in our travel trailer, the #SilvaBulletRV. Storm got to experience camping for the first time – and not just a couple weekends here and there. She joined us the entire time. From hanging out at campfires, to meeting our fellow campers, to spending nights in a new place, she was a champ, and took it all in with joy! Good thing too; because we plan on doing the same thing this year! We also did a family road trip to Florida last August. That trip included Storm. It was her first road trip, and what a first one it was. We traveled over 5000km! While we don’t have any plans for a long road trip this summer, we feel that it is important to get Storm used to traveling with us. She is very much a part of our family, and we want to take her everywhere we go when possible. We learned a lot of the basic skills that she needs to know: sit, down, stay, heel. But they need some fine tuning. Wendy would love to see Storm doing some agility activities as a way to keep Storm mentally active as well as physically. Storm is very agile when playing and running around. Her trainer suggested taking the course. I think she would do really well. Scholars In Collars, where we took Storm for training, offered puppy drop-in, where owners could bring their pups to socialize with other pups. This was only available until she was about 5 months old, because of her size and energy level. Diane, owner of Scholars In Collars, recommended a place to take Storm for “doggy daycare.” This would give her an opportunity to learn some manners when interacting with other dogs and, hopefully, make them less exciting when go on our walks. She wants to be with other dogs so much that she is easily distracted and gets very excited. We have yet to take Storm to a leash free park. We have one pretty close to where we live. Because she was so young and small, we didn’t know how well she would do. But spring is coming and it will be time to get outside! Storm has been amazing with our girls. Rachel and Lauren take her for walks, and play with her any chance they get. We want to help nurture the incredible bond they have with Storm. Having them help with feeding, taking her for walks, playing outside in the back yard, and helping clean up the back yard, all help build a relationship, and teach them that having a pet isn’t all cuddles and kisses. They have been so helpful in getting Storm climatized to us, our home, training, and traveling. We’re looking forward to another exciting year with Storm, and conquering her “Live big” bucket list. Storm is super stoked about working with Purina as an ambassador for 2017, and showcasing herself and some fun stuff here on my blog, and all of our social channels.